When someone says The Sunshine Blogger Award, what words spring to mind? For me it’s Light. Hope. Happiness. Laughter. Fun. I want this blog to be filled with all of those things and I hope that I already create a sense of some of them here on A Light In The Darkness. So I want to begin by saying a big thank you to the wonderful May for nominating me for this award and giving me the opportunity to share with you one of my passions besides writing and trying to change the world: Books! If you could be an author, who would you be? Probably Sita Brahmachari, not only does she pen the most incredible books about subjects like grief, war, bullying, friendship, poverty and love, she is also a full-time campaigner for Amnesty International, a human rights organisation. She works with refugees and allows them how to express themselves through writing. She blogs at this blog here. She is an extremely down-to-earth and inspirational person and I’d love to be like her. To read my book review of three of Sita’s books, click here. If I could be another author, it would be Michael Morpurgo, he writes with such strong feeling and emotion about real things that happen in the world. He is a master storyteller and he really wants to make a difference. The way he gets inspiration for his books is amazing, it’s all through experiences he has and chance conversations with random people. He inspires me a lot. What book(s) do you wish you wrote? Moon Bear by Gill Lewis, the story line is so complex and touching. A girl sacrifices her life for the sake of doing the right thing. The author creates beautiful characters that you feel so connected with. The dialog is convincing and realistic (something I struggle with when writing my own novels). Her art of describing is also incredible. I highly recommend it. The Penderwicks by Jeanne Birdshall. The main reason I wish I wrote this book is the way the author is so clever with the characters. It is a sort of modern version of Little Women, following the crazy lives of four sisters, but Jeanne makes it totally her own. She manages to keep up the unique personalities of each sister throughout the whole series. Rosalind: The responsible and sensible, kind and caring eldest sister. She is practical and loves to bake, but can sometimes be taken to romantic notions! She is looked up to by all her younger siblings. Sky: Stubborn, smart and out-spoken Sky is the second Penderwick sister. She wants to be an astrophysicist when she grows up and believes in science and fact. She finds her sisters extremely annoying, but is never afraid to be brave and stand up for them in an emergency. Jane: Jane is the crazy, dreamy third sister who spends each and every moment of her day with her head stuck in one of her books. She hopes to become an author one day and practices writing poetry and stories all the time. She has a habit of using long words. Batty: Her name is short for Elizabeth, she’s named after her late Mother. She is quiet and sensitive and loves to try and help others. She also seems to understand animals in a way none of her sisters can. How fast of a reader are you? Um, very very fast. I literally DEVOUR books! I read the average book in two days. Which book character would you totally want to meet, but fear might kill you? The fearsome Nancy Blackett from Swallows and Amazons by Arthur Ransome. She is my absolute idol. I have walked around in a red bobble hat and black cowboy boots since I first read the book aged about seven. I want to meet her and be her so much! She is a young female pirate, who resides over Lake Coniston in The Lake district, UK. She’s captain of a boat called Amazon whom she sails with her sister, Peggy. They live off grog (ginger beer) and great hunks of fruitcake. It’s just good old-fashioned adventure and some of it is actually quite exciting. What books have you cried over (if any)? The Child’s Elephant by Rachel Campbell-Johnston. It is quite a serious book about child soldiers in Rwanda and it really shocked me. I had no idea that this sort of thing went on in the world and I found it deeply moving. To read my book review that I wrote two years ago click here. What do you do besides reading? Well, obviously writing. And blogging. I really enjoy to swim too. I am a total water baby and rejoice in the freedom that being in the water grants me. Out of the pool, I am not agile at all, so it’s liberating for me. I also love baking and creating new recipes to share with my family and friends. I am learning about foraging, wild food and herbal medicine too, I find that so interesting. My other hobbies include skiing, sailing and hanging out with friends. How would you react if all the books suddenly disappeared from the world? I cannot possibly imagine that and I’d rather not, if you don’t mind. Ha ha! Book-to-movie adaptations: Like or hate? What book have you been dying to read, but haven’t gotten the chance to? One by Sarah Crossan. It’s about conjoined twins who’ve been home educated all their lives and then go to school. I find the concept of being physically joined to your twin incredible and being home schooled myself, I am curious as to how the author writes about their experiences. It’s also written in poetry form, which I feel would enhance the story. Would you rather get paid to read books, review books, or blog about books? The first one and the last one. But, if I had to choose, I would say ‘get paid to read books’ as I’m not the hugest fan of writing book reviews and I could still blog about other things. WOULD YOU LOOK AT THAT ONE OF YOU FAVORITE AUTHORS IS STANDING ACROSS THE STREET FROM YOU WHAT DO YOU DO??? I’M GOING TO WRITE THIS IN CAPS TOO ‘CAUSE IT’S SO EXCITING!!! Okay, I’ll stop now. I would tell myself that now is no time to be shy and that this is a once in a lifetime opportunity. Then I would walk across the street and say “Excuse me, can I take a picture with you?” If they said yes, which they would because I only like kind authors, I would be posting it on this blog as soon as I had an internet connection! I would ask them a few questions about writing and then thank them profusely before happily skipping away. If I’ve nominated you and you’d rather not do this award, that’s fine! I totally understand. If I haven’t nominated you, please don’t be offended, instead feel free to take part. What words do you live your life by? How do you think that you personally can change the world? What do you want more than anything else in the world? What book left you speechless? Describe one memory that you would never want to lose? What song could you sing for eternity? Which blogger in the blogosphere can you relate to the most? What in life challenges you the most? Okay, enjoy and let me know how you get on! 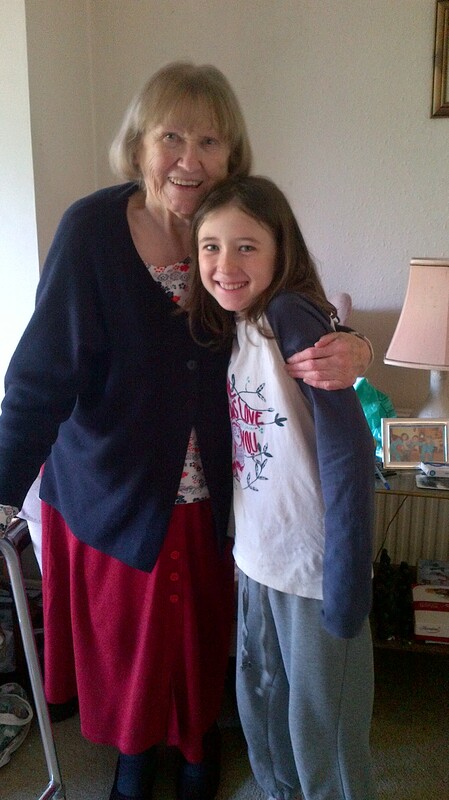 At the moment we are in Essex staying with my Great Granny, who has just had a hip replacement. We are cooking and cleaning for her, chatting with her and just hanging out. While we’re here we’ve been doing things differently than when we usually visit, normally granny does everything for us and spoils us. Now we are doing things to help her. We have to be more helpful and do more jobs. We have to be considerate, which means knowing when to be a bit quieter and when to have a nice long chat. We’re being more thoughtful, we do things for granny, like little jobs, without being asked. All these things are good, it’s important that we don’t always think of ourselves. Being here with granny is a chance to show her how much she means to us all. Hanging out with granny is really nice. I like to talk with her, she has lots of knowledge, experiences and memories to share with me. We have lots of fun times together playing games, listening to music, watching films and discussing books. We have similar tastes in all these things so we both enjoy them. She is the best granny I could ever wish for and I want her to know that. Just school work today, started off with setting Evan’s and Irys’ English lesson, then a bit of reading, followed by a page of mental maths, a section on 3 x table in the times table book, some practice in the other x table book and 3 pages of my problem solving book. Then science, learning about life science, people, animals,plants and all living things!!! Got a really good new mystery book called ‘The mystery of the missing masterpiece’ by Helen Moss. The series is called Adventure Island!! It’s awesome because it takes lots of twists and turns and it’s really exciting!! Has any one else read it?